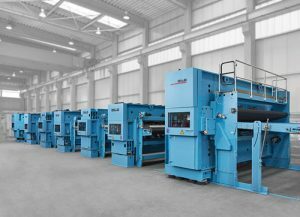 Since 2015, Germany-based DiloGroup has sold 10 complete high-capacity needling lines to Huafon Microfiber Co. Ltd, a producer of man-made leather from islands-in-the-sea fiber. The machines are installed in Huafon’s new plant in Qidong, Jiangsu Province, China. The 10 lines feature DiloTemafa high-capacity blending systems, Dilo- Spinnbau card feeding systems with Twinflow, high-capacity carding machines, high-speed crosslappers with special air-guide systems as well as needlelooms with Hyperpunch technology from DiloMachines. All of the lines feature the CV1 system to ensure product uniformity. Six lines are already in operation at Huafon, two lines soon will be operational and the remaining two lines will be shipped sometime during the first half of 2017. Huafon Microfiber will install a total of 10 high-capacity needling lines from DiloGroup.